It’s a strange sensation when you study the face of someone who’s fallen asleep. You sense that although they are physically with you, they are not really there. It reminds me of when I was a small child lifting my grandmother’s eyelids and asking if anyone was at home. To come across the park and gardens of a slumbering Versailles is equally disconcerting. In the winter six months of the year the 1200 palm trees, pomegranates and oranges of the Orangerie Parterre are tucked away from public view inside the glass-fronted south-facing Orangerie. The fabulous collection of 17th and18th century garden statues are wrapped to protect them against frost damage, and the best of those wonderful grove gardens (bosquets) are locked ‘to protect from vandals and thieves’. 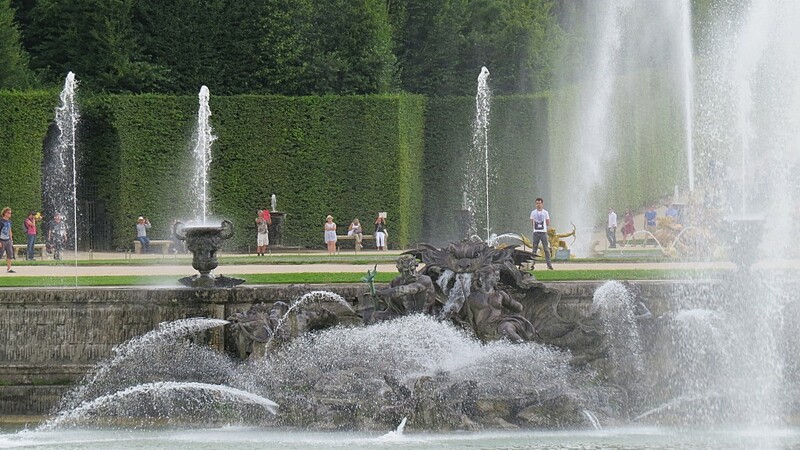 The water to all those wonderful fountains is turned off; without water Versailles is only half a garden. During the summer six months the trees in their Versailles planters are brought out giving the Orangerie Parterre an enlivening third dimension, and the statues shed their winter coats. 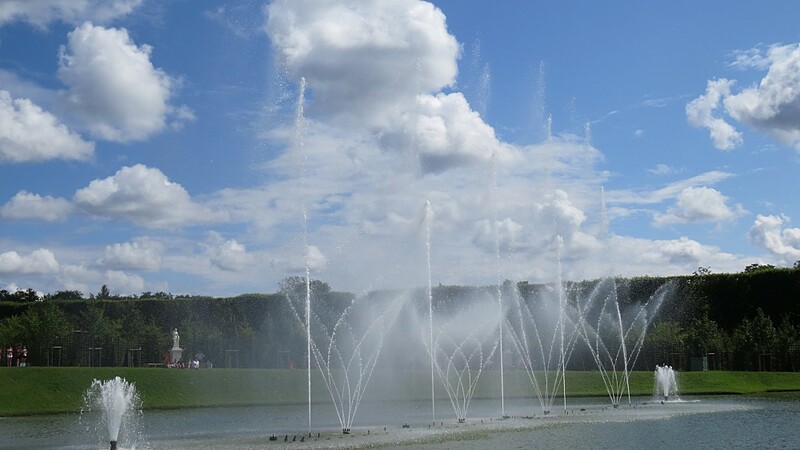 Unfortunately The Musical Fountains Show which transforms Versailles into something thrilling, exuberant and magnificent is just for a couple of hours a day on Tuesdays, Saturdays and Sundays and then the presence of Versailles’ creator, Louis XIV, The Sun King is very much in evidence. 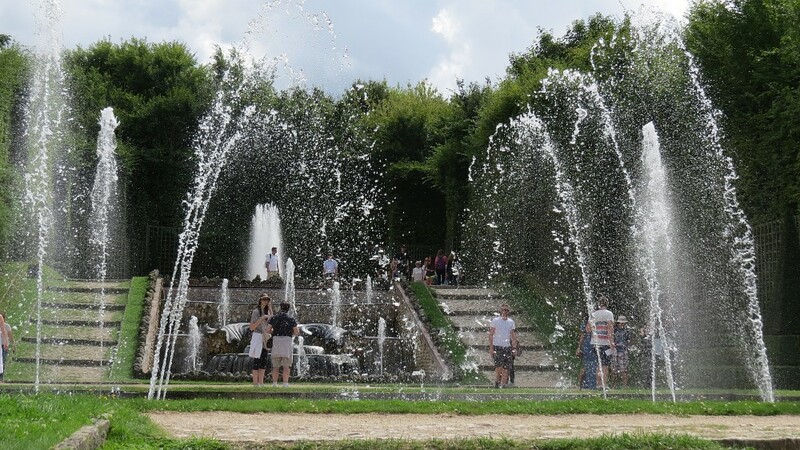 There has always been an inadequate supply of water for all the fountains to work simultaneously, but in view of the colossal number of visitors that come to Versailles why not have a fountains show every day, rather than a miserly three days a week? 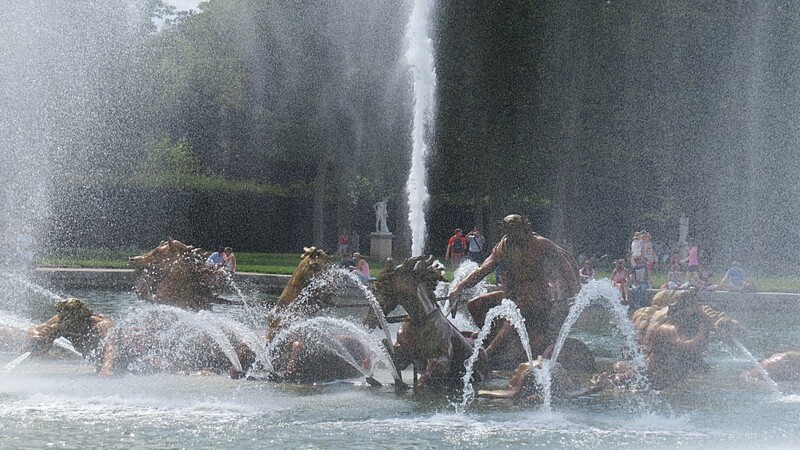 The two great fountains of Versailles are the Fountains of Apollo’s Chariot that form a focal point on the main axis of the garden and the even more spectacular Dragon and Neptune Fountains that lie at the end of the cross axis Water Avenue. 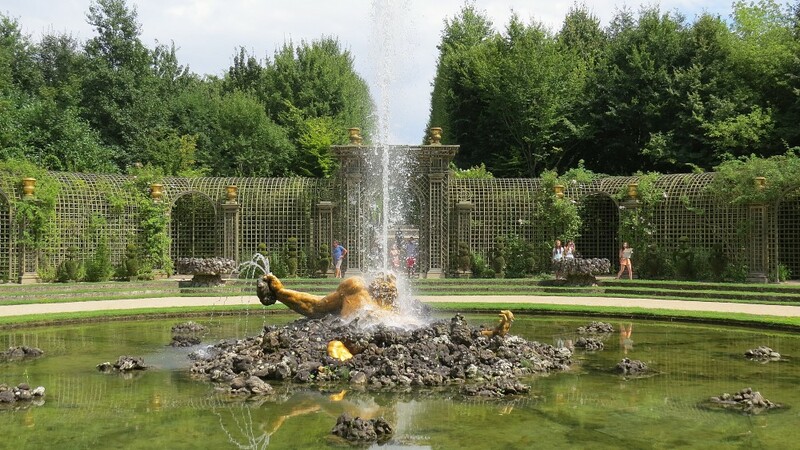 On the previous occasions that I have visited Versailles these great fountains have been reduced to glorious pieces of tarnished gilt sculpture set in tranquil mirrors of water. When they are working they are astonishing and thrilling spectacles, especially when accompanied by 18th century French music. The much smaller Mirror Fountain hidden away amongst the grove gardens is delightful in its own more modest way, with its computer-programmed playfully whimsical sequence of water displays. Around the Mirror Fountain are thirteen grove gardens that are concealed in a regimented grid between the formal parterres adjacent to the Palace and the Grand Canal. Many visitors miss them altogether thinking that the grass avenues with their dense hornbeam hedges and fountains at each grid intersection are the main feature. Although I have visited Versailles many times, it wasn’t until this summer that I was able to see all those padlocked hidden gardens. Many of the lesser ones that have been changed over time are accessible all year but are to my mind of scant interest. The locked masterpieces are the restored and surviving gardens designed in the 1670s and 1680s by Andre Le Notre, and each is a world-class garden in its own right. There are five of these, and three of them I find to be simply breath-taking. The Enceladus Grove was restored to its original appearance in 1998, and has as its centrepiece the fabulous statue of Enceladus sinking into the molten magma of Mt.Etna as a punishment from Zeus. A stupendous circular trellis tunnel arbour encloses the pool and allowed the fashionably pale skinned court ladies to promenade protected from the sun. It is difficult for me to grasp that this timeless design is almost 350 years old. Even more spectacular than the Enceladus Grove, is Le Notre’s Ballroom, a stepped amphitheatre of marble, rockery and shells over which water cascades and jets of water rise. To the opposite side are grass slopes where the musicians played, and often a stage was set up in the centre of the grove for dancers. At other times it was used as a theatre or for lavish receptions. 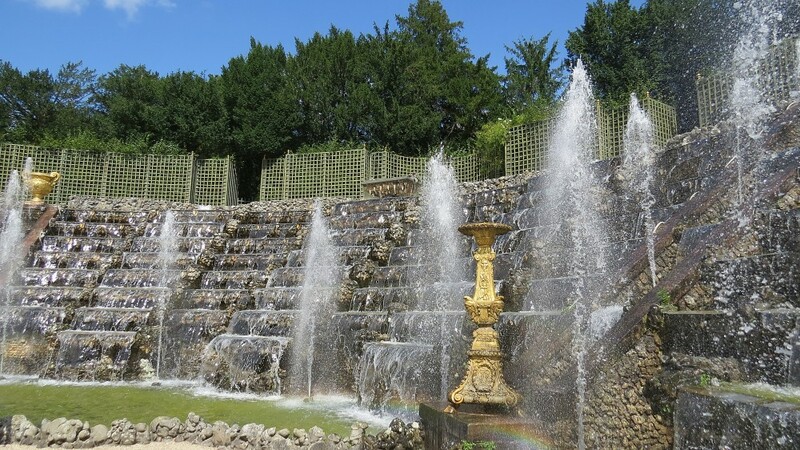 With the sun catching the cascading water, it is for me, one of the world’s most spectacular small gardens and there is a real sense of the brilliance of Louis XIV’s court. The third garden I particularly admire is the Three Fountains Grove where Le Notre made a spectacular use of the falling site with a skilful sequence of fountains, pools and cascades. Regrettably for the hundreds of thousands visitors that come to Versailles it is a summer garden, but even then only to be seen in its full glory for less than ten hours a week. This slumbering giant continues to grow in my estimation. It is impossible not be impressed by Le Notre’s delightful bosquets and the stupendous fountain display. 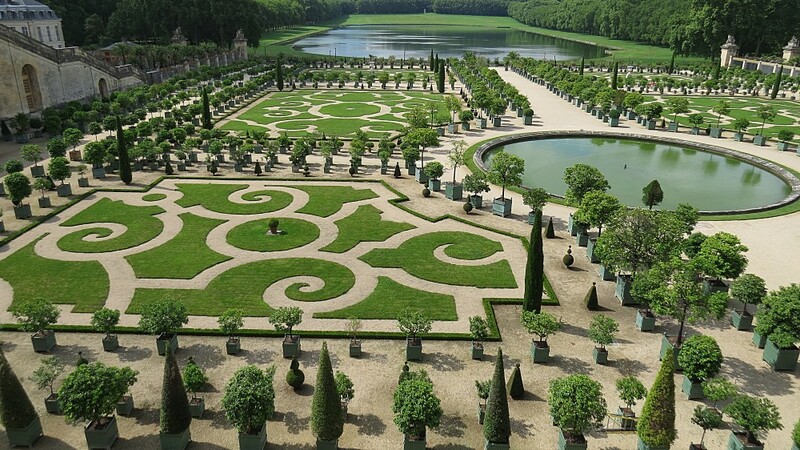 Louis XIV’s vision of the gardens of Versailles was simply breath-taking.